What do the Dashboard Lights Mean? Your vehicle is important to get you to and from your destination. Keeping it maintained regularly will help reduce issues that could have been prevented. Sometimes, you may notice that the dashboard warning lights for the vehicle might turn on. It might be one, or it might be a couple different ones. Knowing what to do will help decrease further damage to your vehicle, and reduce stress as well. The owner’s manual for your vehicle will mention what each of the lights mean. You can also contact us and we can inspect the vehicle for you if one of the warning lights illuminates. Different lights can mean different things. If they are flashing, it will indicate that the issue is more serious than if the light just turns on. When a dashboard warning light illuminates, also look to see what color it is. If the warning light is red, it can indicate a potential serious problem or issue with safety. Noticing a yellow or orange light might mean that there is a part that needs to be repaired or serviced. This could include low tire pressure or the brake system. When the engine temperature light comes on, this can be a sign that the engine is starting to overheat. There can be a few different causes of this. If the engine is overheating, make sure there is enough coolant in there. The temperature gauge may also be stuck. If you notice the light illuminating on the dashboard, make sure to schedule an appointment with us. We can check all the areas of why the light might be turning on for your vehicle. 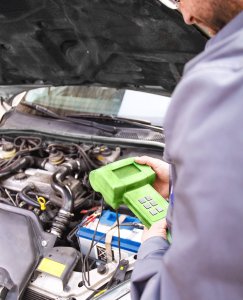 When inspecting the vehicle, we can help to ensure that everything is working efficiently. This will help your vehicle to be reliable as you drive it. This entry was posted in Road Trips, Safe Driving Tips, Vehicle Safety Inspection, Warning lights. Bookmark the permalink.